The Arkansas Finish Line Coalition, a growing group of medical professionals, child-serving organizations, and advocates, has the following goals to reach its mission of covering all children in Arkansas. Enroll children who already qualify for ARKids First but aren’t signed up, and keep them enrolled each year. Extend health insurance to more Arkansas children by raising the family income limit from 200 percent of the federal poverty level to 250 percent, as passed during the 2009 legislative session. Expand coverage to more children and families and improve access to care by working with partners to successfully implement the new health care law in Arkansas. 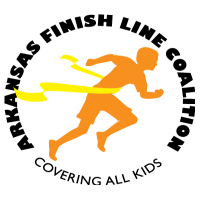 To join our effort or for more information on the Arkansas Finish Line Coalition, contact us here. The coalition is supported by the David and Lucille Packard Foundation.